You’re a crooked one, Mr. Grinch, colluding with foreign countries, putting our country in jeopardy. For the past two years, you have been a revenge-seeking Grinch, trying to ruin our Republic. At first, we sat in horror, watching you steal the soul of America. You tested our democracy, seeing if our institutions, laws, norms and basic decency could hold. Your crookedness shocked us into awakening out from our complacency. You jolted us into a large-scale civic and social education. We decided to learn about local and state elections, about the way that government works, about policy, and the systemic economic inequalities. You’re a mean one, Mr. Grinch, promising to build walls and encouraging racist violence. Your meanness exposed our racism, the darkest part of ourselves. You forced us to look at gerrymandering and how the electoral college systems were designed to suppress and better control non-white voters. Instead of squashing the energy we had been putting into denying the shameful part of ourselves, we are using that energy to heal, digging deep and discovering new strengths within us. You ignited a surge of new voters to register with the use of text-banking and social media, participating in our democracy like never before. We elected the most diverse Congress in our history, making it more possible to work together toward a greater civic, political and national goal. You’re a foul one, Mr. Grinch, calling ladies pigs, dogs, and horseface, bragging about sexually harassing women. You have insisted on controlling women by taking away their reproductive rights and nominating a sexual abuser to the Supreme Court. Your foulness empowered an unprecedented number of women to run for elected offices. Armies of women marched, door knocked, phone banked, wrote postcards, and called their representatives, rallying together to elect honest, decent people who love this country. Rather than tiptoe around a system that was built to suppress women’s power, women created an unstoppable movement to reverse the behavioral habits of centuries. 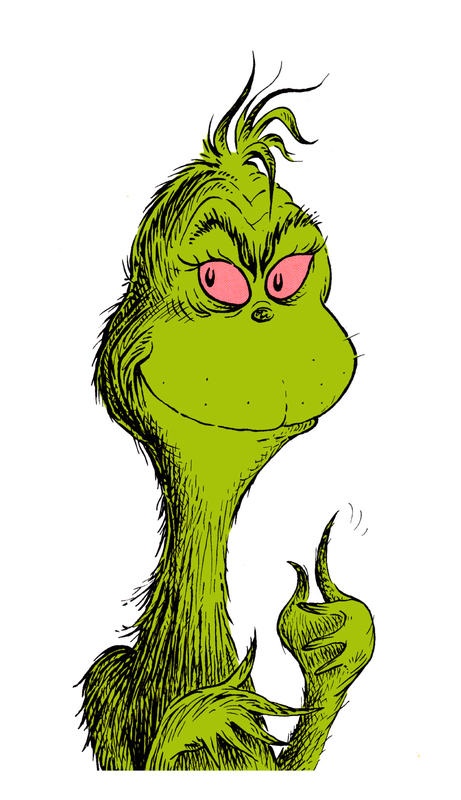 You’re a vile one, Mr. Grinch, working to strip millions of poor people of health care benefits. You do not sugarcoat your ideology. You made it abundantly clear that you planned to blame the poor and the immigrants, banning Muslims from our country, separating children from their families at the border, and making poor people pay for rich people’s massive tax cuts. Your vileness raved about caravans of desperate unarmed people, including mothers and small children while allowing men armed with AK-15 assault weapons to come into our schools, churches, and nightclubs and shoot innocent people. Even for you, this seems extremely Grinching. Most of us try to avoid adversity. We try to get away from hurtful people we don’t like who push our buttons and make us uncomfortable. We cannot hide from your vileness. We see it every day on the news, on twitter, and the airwaves. You have forced us to grow in ways we didn’t know were possible. You’re a monster, Mr. Grinch, rolling back laws that protect our air and water from toxic pollutants. Your rottenness helped us to see the difference between positive thinking and positive focus. Positive thinking is watching our country fail for the masses but telling ourselves that things were great. A positive focus is telling ourselves that things will be great when our country works for all of us and we focus on the greater good. We are moving toward a goal. We can see it. Your character assassinations and cruelty will not stop us. We will maneuver around the negativity and remain headed in a positive direction. You have mobilized us to stand up for what we value. You didn’t steal our democracy, Mr. Grinch. You have strengthened it. We now can transform America into something great again.